Fire crews helped rescue a calf Monday after it fell into a well in rural Sonoma County, according to officials. The approximately 6-month-old calf fell into the 16-foot-deep well at about 4 p.m. on a property on Fallon Road, just west of Petaluma. The owners said the well had been boarded up but the animal crashed through the rotting wood. 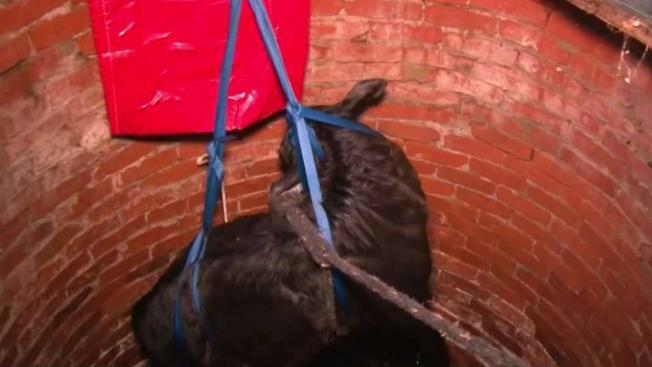 They estimate the calf had been stuck in about 3-4 feet of water for about 4 1/2 hours. Fire crews helped fixed a harness to the baby cow and hoisted to freedom as its mother watched nearby.